I love raw oysters, so I was skeptical the first time I heard of grilled oysters. 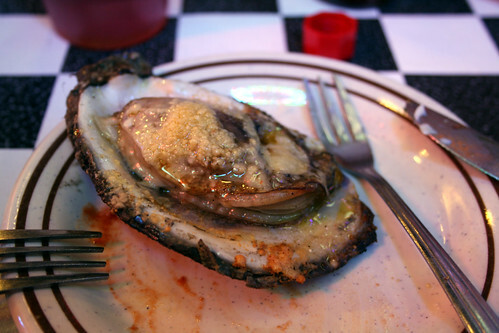 Then I tried them at the Acme Oyster House in New Orleans, and I was more than willing to change my mind. Last weekend, we tried grilling our own, following Emeril’s recipe. 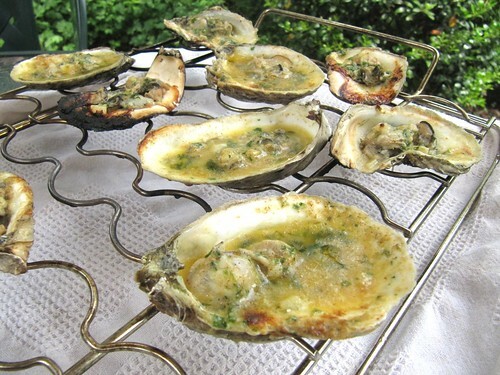 The oysters are shucked, topped with a compound butter (with garlic, parsley, chives, lemon juice, cayenne, hot sauce), and grilled (we have a special rack to make sure they don’t tilt and lose those delicious juices, which are divine when soaked up with some crusty bread). They were almost perfect – next time we will add an extra sprinkling of Parmesan for that crispy texture. As J was shucking the oysters he made an interesting discovery – an Oyster Crab! They’re tiny (1/2″ or less) crabs that live inside oysters. I did exactly what you’d expect me to do: I took a picture of it, Googled it, then fried and ate it.